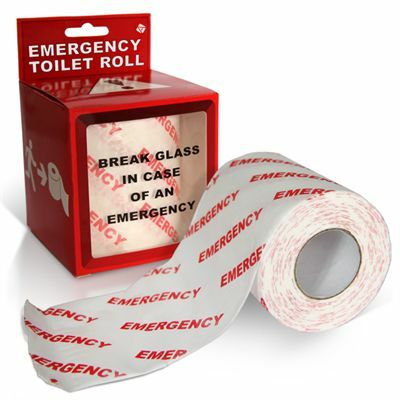 The emergency toilet roll is a real roll of toilet paper supplied with a box shaped like an emergency box. The clear plastic in front of the box is printed with “Break Glass in Case of Emergency” and the toilet paper is printed with “Emergency” motif. The roll fits most of the paper holders. The box is 10cm (4”) long, 10cm (4”) wide and 15cm (6”) high. for submitting product review about Emergency Toilet Roll.